First, you will have to decide if what you need is a single-stage or two-stage unit. Single-stage units are smaller and less powerful, but they are quite suitable to clear smaller quantities of snow accumulation. On a single-stage unit, the auger (which is the paddle mechanism visible from the front) pulls the snow into the machine and directs it out via a discharge chute. On the other hand, two-stage units are in general more powerful and can clear much deeper snow accumulations. Furthermore, on a two-stage unit, the auger picks the snow up, but a separate impeller directs it to the chute which blows it out of the unit. Another decision you'd have to make is whether you will get an electric or gas-powered snow blower/thrower. Two-stage units are usually gas-powered, while electric single-stage units are quite common. Note also that electric units should not be considered for clearing more than a depth of 10 inches of snow. For deeper snowfall accumulations, it is recommended to get a more powerful gas powered two-stage unit. This article will compare two of the most popular and best rated gas-powered two-stage units. If you'd rather see a comparison of two of the most popular and best rated electric single-stage units, please click: Comparing Electric Snow Blowers/Throwers: Snow Joe vs. GreenWorks. 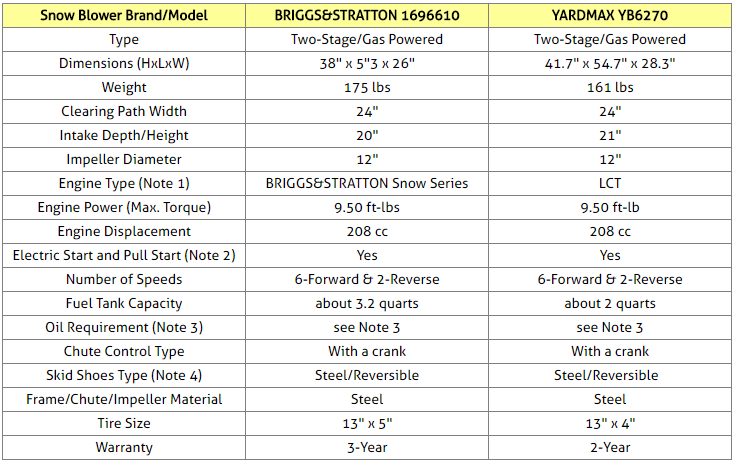 This article will compare BRIGGS&STRATTON 1696610 and YARDMAX YB6270 two-stage snow blowers. These were not just two of the most popular among Amazon customers at the time this article was written, but they had also received excellent reviews from most Amazon buyers (an average of at least 4 stars each out of 5 stars!). Both snow blowers are equipped with a 208cc engine capable of maximum torque power of 9.50 ft-lbs. BRIGGS&STRATTON snow series engines are specially designed to start strong (down to -20°F) and power through in the toughest winter conditions. They offer uncompromised power and displacement to help you get the job done. Plus, oversized controls provide mitten-friendly operation​. The engines used on YARDMAX snow blowers are made by LCT (Liquid Combustion Technology), a US owned, managed and operated company that manufactures air-cooled four-cycle gasoline engines for related outdoor power equipment markets. It has a proven track record of quality and engineering excellence with millions of engines sold in North America alone. These snow blowers are equipped both with a push-button electric starter and a pull starter. When using the electric push-button starter, they can simply be started using normal household 120V. This is normal for electric starters found on most snow blower brands and models. These snow blowers have a separate small tank for the oil. Both snow blowers require 5w-30 type oil due to the cold weather usage (see Amazon products section below). The steel reversible skid shoes make plowing through the snow easy. It takes less effort to maneuver the unit though any condition of snow​. The two snow blowers/throwers considered here are excellent products as shown by the average rating each had received from Amazon customers at the time this article was written. Indeed, they had each received at least 4 stars (out of 5 stars). Both snow units considered here feature a 24-inch wide clearing path and at least 20-inch intake height for clearing snow with extreme efficiency. Both units include a push button electric start for effortless starting in the coldest weather with the durability to work through heavy snowfalls. Customers who bought the BRIGGS&STRATTON snow blower have reported that it comes with oil already in the unit, the controls are easy to use and that all functions operate as they should. Though it makes some noise when the auger is engaged, that is to be expected. Otherwise, it is not too loud either. You will notice that it starts right away and plows easily through all of the heavy stuff. The only thing to look out for are the assembly instructions which could be improved. Note that the auger, impeller and drive mechanism come already fully assembled which is a huge plus, but you will need to attach smaller items, such as the handlebars and the chute. Assembling the unit should not take more than 30 minutes if you follow carefully the instructions. ​Customers who bought the YARDMAX snow blower have reported that it has plenty of power for clearing accumulated snow, easily throwing the snow 20-30 feet. They find that the controls are simple, and that assembly is easy, taking about 30 minutes as long as you have the right tools available. The blower is super solid, and you can run it with the auger and impeller producing almost no vibration or unwanted noise. The chute is excellent with its all metal design and easy to rotate crank handle. The all-steel impeller insures that you don't break it in icy conditions. The controls work great, and the drive system does a good job forward and reverse. The few complaints about this machine had to do with occasional poor packaging resulting in some damaged parts. So, if you choose this unit, make sure you check well that all parts are in order when it arrives. Are you are looking for a snow blower/thrower with a Remote Chute Deflector? In many snow blowers/throwers, it is necessary to stop the unit and come from behind the unit to the front in order to modify manually the direction of the chute discharge. From a standpoint of safety and convenience, it is of course better for the operator not to leave his position behind the blower at the controls when he needs to change the direction of the discharge. Therefore, some more advanced snow blowers are equipped with a remotely controlled discharge chute deflector that can be controlled from the operator's position behind the unit, directly from the control panel. This means that the direction of the chute discharge in such snow blowers can be adjusted remotely, simply by operating a control handle from the control panel behind the blower. BRIGGS&TRATTON 1696614 has similar features to the 1696610 model compared above, but it also comes with such a ​remotely controlled deflector. As a bonus, it is also equipped with headlights!